"The Markbass product line is specifically engineered to not color the sound of the bass. Rather, our gear is designed to faithfully replicate the unique tonal characteristics of whatever instrument is being played through it. That has been our mission since the beginning," asserts Marco De Virgiliis, the founder of Markbass Amplification. He adds, "instead of imposing my idea of a particular sound on the market, I'm simply responding to what I hear over and over from bass players around the world." For this reason, Markbass has become acknowledged as an innovator of high-end sound reinforcement amongst the international bass community in just four years. With its facilities based in Italy, Markbass utilizes state-of-the-art technology to produce several product lines of amps, cabinets, and combo amps to address the needs of professional bass players in every performance application. Markbass products have not only been hailed by the critics for their ability to accurately amplify bass frequencies but also for their unparalleled power-to-weight ratio and their pioneering advances in ultra-lightweight technology. As the list of endorsing artists for Markbass continues to expand globally, world-renowned bass icon Jeff Berlin has called Markbass the best bass amplifier he has ever played through. In this interview, with the assistance of Markbass artist relations representative Peter Murray, the founder of Markbass Amplification, Marco De Virgiliis, discusses his concept behind manufacturing some of the most lightweight amps and cabinets in production using the neodymium technology, designing units with a unique color scheme, the tonal difference between front and rear-ported cabinets, making Markbass products readily available to bassists in the United States, and the debut of the new Jeff Berlin signature combo amp. In the late 1980's, I was working in research and development for an Italian telecommunications company called Telettra, but I also had a passion for music. Although my instrument was saxophone, I noticed there was an opportunity in the market for a new kind of bass amplification. Trace Elliot was very popular in Italy at the time, but I found the sound of these amps to be very colored. I felt I could improve on this. With all the new developments in bass guitars and bass techniques, I wanted to come up with a cabinet that didn't add coloration, one that did justice to the source sound. I made my first cabinet prototype in 1989. It contained a 15" woofer, two 6" speakers, and a tweeter. Soon after, with my partner Sisinio Olivastri (with whom I worked at Telettra), I made an amplifier prototype, paying very close attention to every tiny detail in every step of the signal chain and using only the highest quality components. We used much of the same technology that was being used in telecommunications equipment. I started getting many bass players in Italy, as well as touring bass players, to try our amp and cabinet. Jimmy Haslip was one of the first, and he was very impressed. The reactions of bass players were so good that I became convinced there was a future for my products. In 1996, I quit my job at Telettra and started my own company, Parsek. I made more amps and cabinets and drove 100,000 kilometers a year all across Italy, showing and selling my equipment. In 1999, I entered a partnership with MusicMan and designed as well as manufactured amps and cabinets for them under the name Audiophile. For the cabinets, we produced our first neodymium speakers in collaboration with B&C speakers, another Italian company that still makes our speakers. These were the first neodymium speakers ever used in bass amplification systems. Through all this experience, I learned a lot about the bass market, traveled the world, and met many of the world's great bass players. In April 2001, I decided to launch my own brand of bass amps. I called it Markbass. By the end of that year, we were already quite established in Italy and started selling our products across Europe and beyond. Things have been progressing very well and very quickly ever since. What is the concept behind Markbass amplification? 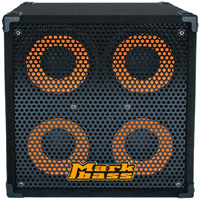 Markbass products have always been geared toward the needs of bass players. Instead of imposing my idea of a particular sound on the market, I'm simply responding to what I hear over and over from bass players around the world. Bass players want amplifiers that accurately and faithfully reproduce the sound of their instrument, have sufficient power to give them headroom, are light and easily portable, are extremely reliable, and are affordable. After working for many years using the best technology available, I believe I have accomplished this goal. Happily, more and more bass players seem to agree! 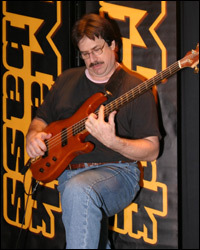 At its debut, what was the first piece of equipment produced by Markbass? An SA450 amplifier was the first Markbass product to be completed, but by the time Markbass was founded, we had already made many amps and cabinets so we began making an entire product line. At that time, we also started using the second generation of B&C neodymium speakers. As a relative newcomer in the bass amp manufacturing market, what do you feel Markbass can offer bassists that other long-established amp builders can't? Our products use the most advanced technology available, and every component used is of the highest quality. Everything is tested thoroughly by both computers and engineers. This high level of technology and quality is the reason our products are the lightest on the market and also the reason they're so reliable. Since Markbass began, we've had almost no component failure in our products. The failure rate is currently 0.06%. The Markbass product line is the lightest on the bass amp market, arguably the most reliable, and we believe also the best-sounding. In addition, we offer a cool new look for bass amps and excellent value. Most of the amps and cabinets that are less expensive than ours are made in China to lower quality control standards. With Markbass currently manufacturing some of the most compact and lightweight amps in production, how are you able to achieve this engineering feat without sacrificing tone? Weight has been a consideration in the selection of all our building materials and components. However, sound is always the bottom line. For example, many woods are light but not strong and don't work well sonically. We've chosen Italian multilayer poplar for its exceptional combination of light weight, strength, and good sound. Neodymium technology is the main factor in making our cabinets lightweight, and the speakers we've developed in collaboration with B&C are, in my opinion, the best available, not just because they're light but because they sound incredible. Our speakers have evolved tremendously since our first efforts, and now I believe they are the best in the world. It took us many years of hard work to design these speakers, and they cannot be used by other manufacturers without our consent. In our amplifiers, our digital power supplies are 30 times lighter than conventional analog power transformers, but they've also been specially designed to have exceptional results for bass amplification. We're very proud of the lightness of our products, but this would be a hollow achievement if the amps didn't sound good. We've been receiving top reviews for tone in bass magazines, and some of the most discriminating bassists in the world are using our amps so I believe we now have the best of both worlds: great sound and ultra-light weight. Was there a conscious effort made in the design process of Markbass amps and cabinets to use a very distinctive bright-yellow/black color scheme in order to stand out amongst its competition? Of course. Back when I started getting interested in bass gear, I noticed that you could identify a Trace Elliot amp from a distance. The effect of this was very strong. I've always liked the color yellow, and I wanted my brand to stand out visually against the competition. At first, some people are surprised by the look because they're not used to seeing a lot of color on bass amps, but when you see these amps on a stage under lights, they look very cool. It's a bold look, but I think this is appropriate for our products. Two special features that are found on every Markbass amplifier are the VLE and VPF filters. What do these controls offer bassists in terms of tonal options? These filters offer bassists quick and easy access to what I feel are the two most useful EQ effects for bass. The VLE filter is a vintage loudspeaker emulator. It essentially cuts highs in a very musical way. This is useful if you want to make the sound less present or less aggressive. Our amps are normally exceptionally clear, but sometimes bassists want to blend in with the music more and draw less attention to themselves sonically. The VLE does this very well and very quickly. The VPF, or variable preshape filter, cuts mids and boosts lows and highs. It's similar to the "enhance" control found on some other amps. This is a popular sound for slap bass as well as many styles of rock. These two filters can also be used together, and the effects can be very interesting and very musical. Are there any other distinguishing features on Markbass amps or cabinets that might not be typically found on this type of gear? Again, Markbass amps, cabinets, and combos have been designed with the needs of the bass player in mind so there are many features that bassists will find handy. For example, the tweeter attenuator on the side of the cabinet allows you to adjust the tweeter level while you're in front of the cabinet so you can actually hear the effect you're having on the signal. Our line out level controls are on the front panels of the amps for easy access. Our speaker outputs accept either speakon or 1/4" cables. The Little Mark II and the combo heads include a secondary balanced XLR input which is necessary for some acoustic bass pickups systems. We also have some unusual models such as the LMK which is a two-channel amp for use with two different basses. This amp is very exciting for bassists who play more than one bass, especially an electric and an acoustic upright, and need to switch back and forth on a gig. With this amp, they can set the appropriate levels and EQ settings for each bass and switch back and forth with a foot pedal without having to make adjustments on the fly or compromise the sound of either instrument. Given that Markbass incorporates neodymium speaker technology into its cabinets, what do you feel are the greatest advantages of this technology? Weight is the only real advantage, but it's a huge one. You will notice that more and more speaker cabinets these days use neodymium speakers, and I think one day all speakers will use them. We've been working with neodymium since the beginning, and I believe our speakers are at the forefront of this technology. Since the Standard series Markbass speaker cabinets are offered as either front-ported or rear-ported, is there a discernable tonal difference between these cabinets? It's important to say that one is not "better" than the other. The front-ported (HF) and rear-ported (HR) cabinets simply have a different sound. The HF cabinets produce a bigger, deeper sound while the HR's could be described as being more focused or tighter in the bottom end. Sometimes players don't want to have too much bottom end, and the HR works better for them, but you certainly can't say that the HR cabinets are lacking in bottom end. The character of the bottom end is just different. Many players who use more than one cabinet will use a combination. 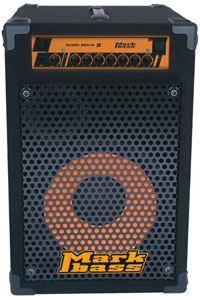 For example, a front-ported 4x10 cabinet is often used in conjunction with a rear-ported 2x10 cabinet. Which product is Markbass' most popular-selling piece of gear, and why do think this particular piece of equipment has become so successful? The Little Mark II amplifier is definitely our most popular model. It's the lightest 500 watt head on the market, and its design is very simple and user-friendly. At 6.39 lbs., it can be carried in a shoulder bag, and some players even put it in the back pocket of their bass case! Because Markbass amplifiers are made in Italy, they are somewhat difficult to obtain for bassists here in the United States. 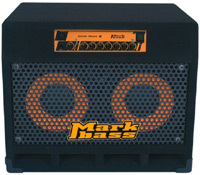 When can we expect to find Markbass products readily available here in the U.S.? The official launch will be at the NAMM show in January, but we're expecting to have Markbass available through U.S. dealers in December. I know many American players have been waiting for Markbass for a long time, and we thank you for your patience! We encourage interested bass players in the U.S. to sign up for our e-mail list on the home page of our web site so we can let them know when the gear is on American soil. Until Markbass products are available in music stores throughout the U.S., who should interested bassists contact in order to try or purchase Markbass gear? Unfortunately, it's just not possible to ship individual orders from Italy. I understand that in the northern U.S. many bass players are driving up to Canada to get Markbass gear, but again, we're very close to launching the line in the U.S. so we hope everyone can hold on a bit longer! What can we expect to see and hear from Markbass in 2006? We're always working on new product ideas. At the upcoming NAMM show, we will launch our Jeff Berlin signature combo which is very similar to our Mini CMD 151P combo but with the amp mounted in the front of the combo, not the top. We will also debut a 3x10 cabinet which is smaller and more portable than a 4x10 but louder than a 2x10. It will be perfect for club gigs. Later in the year, we will introduce a very small but powerful 1x10 combo. Our existing product line is still quite new, and we will be focusing mostly on introducing it to the U.S. in the coming year. We're very excited about this and the future is looking bright! This head's true two-channel preamp is built for versatility. You can use the LMK with two basses (using separate EQ and level settings for each instrument), or you can switch between the channels to use two different sounds with one bass. You can even combine the settings of both channels! Incredibly, this glorious little amp weighs in at just over 6 lbs.! Speaker Out - Speakon, 1/4"
The Standard 102HF cabinet is recommended for bass players who need a smaller pro-sounding rig or for those who like to combine cabinets such as adding a 102HF to a Standard 151HF. Using two 102HF cabs works beautifully with a stereo power amp. Rated at 400 watts RMS, this small cab packs an impressive punch for its size! 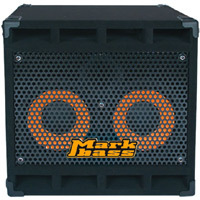 All Markbass cabinets are equipped ultra-light neodymium speakers. This combo delivers incredible, professional-quality sound in a compact package. On its own or combined with other speaker cabinets, the 121 combo is a versatile unit that suits many playing styles. It is designed for bass players that need power, portability, and top performance.